The BoBunny Blog: Day 14 Giveaway and Off The Page Projects! Day 14 Giveaway and Off The Page Projects! If you like stamps you are not going to want to miss the opportunity to win the 3 NEW stamps from BoBunny! Our 3 new stamps are the Gateway Stamp, Stitches Stamp, and To The Point Stamp! Check out the prize image below! Today we are featuring projects that are "Off The Page"! I love to create home decor pieces or gifts for my friends and family. I've had this decorative shadowbox for a bit and I thought it would be just perfect to showcase some of my favorite elements from The Avenues collection. I prepared it by painting it cream. I began by choosing my favorite background paper, then added additional elements such as the fussy cut door layered on top of some cheese cloth. The door was attached with foam dots to allow space to layer other elements. The flowers are all made from the collections pattern papers. 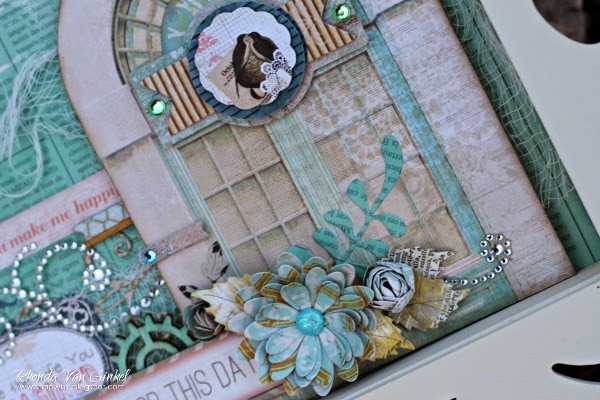 I just love how the various stickers, chipboard, trinkets and jewels all came together for this project. I love Primrose collection. I think that it is so feminine and delicate, perfect to this project. I covered the well using BoBunny papers and after I applied modeling paste on the mask to imitate stones. I used oil pastel to add shadows on the texture. I distressed the papers to the roof and others details. The flowers were made using BoBunny papers. I added a little of acrylic gesso on the papers to get more texture. WOW!! These projects are unbelievably gorgeous!! Love the wishing well and shadowbox so much! My favorite element from Lemonade Stand is the papers! 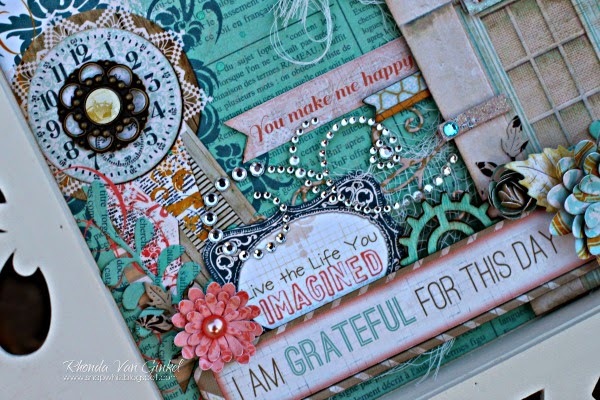 Gorgeous projects and fab stamp give-away - I love the Lemonade Stand papers too! I've been wondering what to do with a similar shadow box - here's some inspiration! Beautiful! My favorite Lemonade Stand product is the paper, Bo Bunny makes the best paper!! My favorite Lemonade Stand item is the Layered Chipboard. Oh my gosh I love 3-D projects! These are both so beautiful! My favorite Lemonade Stand product is the Jewels, so pretty! My favorite piece in the Lemonade Stand collection is the Sidewalk and Block Party papers but the whole thing was absolutely delicious! I love the chipboard in the Lemonade Stand line as well as all the rest. These stamps are just divine and I can't wait to get my hands on them. I have to say that this little wishing well is just too stinkin' cute for words.....I must make this project. My favorite Lemonade Stand product is the layered chipboard. I have got to have these stamps! Love- love- love these! Beautiful projects by the DT! That wishing well is so adorable! My favorite Lemonade Stand piece is the actual paper. The Gateway stamps... OMG!!!! That's all I have to say! First, I love all the bright colors of the Lemonade Stand collection. And the jewels and pretty ephemera. All that really makes a layout pop. Gorgeous set of stamps. Wow, those gates are awesome. Thanks for the chance. Ephemera is my fave Lemonade Stand product. Love those stamp sets, too! The new stamps are awesome! I love the bright colors and embellishments of Lemonade Stand! These are awesome stamps! As far as Lemonade Stand goes - I love the colorful rainbow paper! AMAZING projects today!!! And I love love love the stamps, thanks for another chance to win! These stamps are awesome!! Thanks for the chance to win them. My favorite Lemonade Stand product is the Layered Chipboard...so cute! I love the Lemonade Stand buttons... they're just so versatile on any paper crafting project. Gorgeous shadow box project!! So in love with those stamp sets, thank you for the chance to win - my favourite Lemonade Stand product would have to be the layered stickers!!! Great projects today, lots of creativity!!! Absolutely stunning projects today! That wishing well is so creative. Love it! The stamp says it all "Love This!" - fave Lemonade Stand item ... Layered CHipboard!!! Love love love the stamps. Projects really cute! Love all 3 of the new stamp sets!!! I am not a big stamper but I still must have these - LOVE them!!!! My favourite Lemonade Stand product would be the collection pack. Love these stamps. Thanks for the chance to win. WQow - amazing projects! Love the Lemonade stand collection pack! Love the stamps!! Especially the arrow pack! I absolutely love these stamp sets! So pretty! Plus today's projects are gorgeous. I looked over the Lemonade Stand collection too, and while I love all the beautiful colors, I think the brads and buttons are just SUPER cute! Thanks for the chance to win! The shadowbox is beautiful, the wishing well is fantastic, my favorite product is the Lemonade Stand Collection pack! Oh, and I love the stamps in the giveaway! Wauw! Love those stamps! the gates are super! My favorite Lemonade Stand product: Papers!!! Bo Bunny has the cutest papers in the business!! Favorite Lemonade Stand product is the paper collection - love the colors. And I really, really like the large designs on the 'Stitches stamp'. Lover today's projects! My favorite lemonade Stand product is the layered chipboard. my favorite lemonade stand item is the noteworthy package. Today's projects are gorgeous! love those stamp sets, too. Such pretty projects, love both collections! Wow! I love the Lemonade Stand 6x6 paper pad. As a paper lover/hoarder, I love the papers in this collection! What stunning home decor projects! Well done ladies! My favourite Lemonade Stand product (besides the papers) are the buttons, die cuts and ephemera pack. My favorite part of the Lemonade collection is the collection set of papers!! Love them ALL! BUT...these STAMPS ARE TO DIE FOR!!!!!!!!! Love BB stamps! Great sets! I have a LOT of them! :) Would LOVE to win these! Favorite is the ephemera pack. And wow, Ladies, your projects are gorgeous!!! I love the vibrant colors and patterns on the Lemonade Stand patterned papers. papers definitely. I'm a paper collector, what can i say!!! I love the colors in Lemonaid stand so pretty. WOW!! They are both AMAZING!!! The shadow box is GORGEOUS! As for the Wishing well...that is truly a BEAUTY!!! Wow, what intricate and beautiful projects! Your new stamp sets are fabulous! Lindos projetos! Adoro os papéis desta coleção! Parabéns! great projects, loving the new stamps! Gorgeous projects today! I love the bright and cheery papers in the Lemonade collection. As always, love the projects created by the designers - just awesome! Thanks so much for the ongoing inspiration, new collections, and amazing giveaways!!! Bo Bunny ROCKS!!!! Fabulous projects today. Love them. Love the chipboard in Lemonade Stand as well as everything else. Wow what great projects! Love them! Love the stamps too! Amazing projects! Loving the new stamps! beautiful projects! I love the stamp sets! Love all of these great projects and the stamp sets. Fav Lemonade Stand product is all of them. I love the lacey doily stamps! Beautiful inspirations! Thanks for sharing and for the chance to win. FABULOUS projects shared today - WOW!!! LOVE the new stamps - To The Point would look AWESOME on cards & layouts!!! love the stamps!! beautiful projects..so elegant!! Such wonderful projects! Love them! Love the little wishing well project !! My favorite in the Lemonade Stand collection would be the 6x6 paper pad - could make sooooooooo many cute cards, also LOVE the buttons !! This is the best prize yet. I SO want to win. This collection is awesome. That wishing well is just wonderful!!! Whoohooooooo, those stitches stamps!!! Love those!!! These projects are just gorgeous! Each of them so detailed! amazing projects from such creative and talented designers...my favourite lemonade stand products are the papers with their lively colours! What absolutely amazing creations. My favourite lemonade stand product is the gorgeous chill out paper. It's very difficult to pick a favorite but I love the papers. I love the whole Lemonade stand collection.... but if I must pick one... it would be the jewels. I love all the papers! The colors are fabulous! So hard to choose a favorite Lemonade Stand product - I love it all! The empherma are amazing! Beautiful projects....gotto get my hands on that stamps!!! Love the projects. Pretty papers in the collection. These are both fabulous projects!